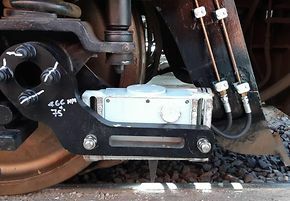 Installation design for the fitment of pneumatically reset tripcocks onto Freightliner Class 66 locomotives. Freightliner, a subsidiary of Genesee & Wyoming Inc. (G&W), wanted their Class 66 locomotives to be able to operate over London Underground running lines for the purposes of hauling rail head treatment trains. These locomotives needed the addition of tripcocks, a train protection device that can automatically stop a vehicle, to ensure safe operation. DB ESG had previously provided detailed design and modification procedure work for the fitment of tripcocks to Class 66 locomotives for an alternative freight operator. They were, therefore, ideally placed to carry out this similar work for Freightliner. DB ESG was contracted to produce the installation design, including the creation of modification, maintenance and test documentation, for the fitment of pneumatically reset tripcocks onto four Freightliner Class 66 locomotives. Requirements capture – review of the interfaces, new design constraints and the installation differences compared to the previous design work completed for the Class 66 tripcock installation. Production of a conceptual design that confirmed the outline design, feasibility of the installation and likely compliance. -Installation of any necessary cab equipment (timed electrical push button to reset tripcock, non-driver’s desk emergency brake button and indication of tripcock operation/isolation). Provision of a modification procedure that detailed the installation of the tripcock, including parts and fixing arrangements. This procedure also detailed the routine testing to be undertaken once the tripcock had been fitted. A type testing procedure was delivered to confirm satisfactory operation of the design on the first modified locomotive. Design approval, including a standards compliance report, reviewed and approved by DB ESG’s sister organisation, Railways Approvals Ltd. Creation of a standards compliance report to confirm that London Underground standards have been met or mitigated. Procurement and supply of components on behalf of Freightliner. On-site support for first locomotive fitment.